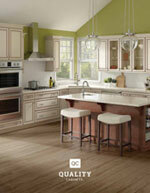 Discover the uncommon value of QualityCabinets™ - offering products to fit any style, project or budget. This brochure features - design ideas for the entire home, functional features and construction details, accessories and decorative accents, along with a complete door style and finish guide. The WoodStar® series offers the best value in cabinetry available today without compromising a thing; great new styles, popular options, and size choices – all with the QualityCabinets™ name. Available as download only.